Working in kneeling positions is a great strain on the body and on your knees in particular. Therefore, it is important to use the right kind of knee protection that fits optimally on your knees. By combining knee protection certified according to EN 14404 with trousers with an ergonomic fit, you are guaranteed the best protection throughout your working day. EN 14404 is a European standard that’s developed to set requirements for knee pads in order to best protect the user’s knees. Knee pads are tested based on different requirements, such as impact absorption, the ability to distribute pressure over the entire surface while kneeling as well as the ability to prevent sharp or pointy objects from penetrating the material. In order to achieve protection in accordance with the EN 14404 norm, you can use MASCOT® Waterloo knee pads in the workwear trousers with which they are certified. Certification is only achieved by combining the knee pads with these trousers. MASCOT® Waterloo are certified according to EN 14404, type 2, class 1, which refers to knee pads that are attached to the trousers using the accompanying pockets and are suitable for work in kneeling positions. 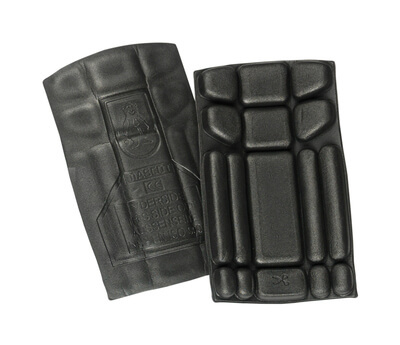 They help provide the best protection during a long working day spent kneeling. MASCOT® Waterloo can also be shortened so that they fit all trousers, while maintaining their EN 14404 certification. Al utilizar las rodilleras Waterloo de MASCOT®, se cumplen todos los requisitos establecidos en la normativa EN 14404. Approved according to type 2: Fixed in the pockets in the trouser legs or permanently fixed to the trousers.